Located on Muharraq Island, many people opt to find properties for rent in Busaiteen, which is a small town situated in northern Bahrain with a plenty of real estate options to select from if you are looking for properties for rent in Busaiteen. Busaiteen is known for its sports clubs, Bahrain Sports Club and Busaiteen Sports Club who compete in Bahraini Premier League and have made great achievements. 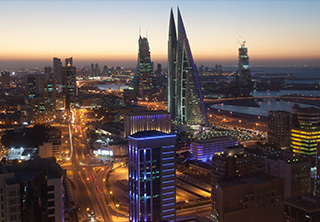 The area is also known for having the first school ever in Bahrain and the entire Persian Gulf region. That's not all, as Busaiteen also has reputed schools and universities such as the Medical University of Bahrain. All of which makes Busaiteen a superb place for families looking to settle down. What's even more appealing about Busaiteen is that it is a serene area and a safe neighbourhood with quality homes for reasonable prices. Busaiteen houses some of the best and elegant properties in all of Bahrain. And whether you are searching for villas, apartments, studios or penthouses that comes either furnished or semi-furnished; Busaiteen offers you all of that and more. One of Busaiteen's exceptional rentals is a private villa with a covered swimming pool. This villa is the perfect family home that offers ultimate privacy. The fully furnished four-bedroom villa extends over an area of 380 square meters and it is available for rent 1,400 BHD. Another unique rental in Busaiteen is a sea view studio apartment that is fully furnished and is extremely close to the Medical University. This apartment is the perfect place for students looking for an affordable rental. The studio is available for rent for 325 BHD. If you fancy a penthouse, Busaiteen has the perfect penthouse for you. With a spacious living room fully furnished with high-quality furniture and a fully equipped kitchen with all modern appliances; the three-bedroom penthouse comes with an attached bathroom for the master bedroom with a Jacuzzi. Sprawled over an area of 100 square meters; this exceptional penthouse is available for rent for 1,200 BHD. A fully furnished apartment with three bedrooms, spacious living room, good quality furniture and 42 inches TV; is also available for rent for 500 BHD. This apartment is perfect for families looking for affordable properties for rent in Busaiteen that offers them quality living without breaking the bank. Busaiteen is characterized by its central location which is close enough to the airport and also within a short distance to Sheikh Isa bin Salman Causeway. The area also offers residents top-notch facilities and entertainment services that meet their expectation and fulfil all of their needs and requirements. From shopping centres, restaurants and cafés, catering to all different backgrounds and nationalities; Busaiteen is the ideal place to live, work and just spend some quality time with your friends and family. When it comes to properties for rent in Busaiteen; Weetas Real Estate has no shortage of affordable, elegant and superb properties for rent. With a qualified team of professionals, Weetas Real Estate's agents are the best in the business to help you in your hunt for the perfect rental.